^ Ian Potter Museum collection: Bushrangers Archived 2011年2月28日, at the Wayback Machine., u21museums.unimelb.edu.au. Retrieved on 9 January 2011. ^ "Bushranger Thunderbolt and Mary Ann Bugg". Accessed 9 October 2011. ^ a b Australian film and television chronology: The 1910s, Australian Screen. Retrieved 8 October 2015. ^ Cooper, Ross; Pike, Andrew. Australian Film, 1900-1977: A Guide to Feature Film Production. Oxford University Press, 1998. ISBN 9780195507843. ^ Reade, Eric (1970) Australian Silent Films: A Pictorial History of Silent Films from 1896 to 1926. Melbourne: Lansdowne Press, 59. 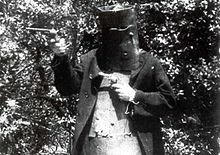 See also Routt, William D. More Australian than Aristotelian:The Australian Bushranger Film,1904-1914. Senses of Cinema 18 (January-February), 2002 Archived 2010年12月24日, at the Wayback Machine.. The banning of bushranger films in NSW is fictionalised in Kathryn Heyman's 2006 novel, Captain Starlight's Apprentice.